Methinks the bi-weekly schedule of Superman is catching up to the creative team, given how many artists and letterers were involved in getting this issue to press. However, I must commend the work of inker Oclair Albert and colorist Alex Sinclair, who maintain the book’s consistent visuals. Bendis makes a hard turn, fleshing out the in-between years of the Boy of Steel. At the end of his Man of Steel series several months ago, Jon and Lois joined Jor-El on a trip through the stars, that Jon could learn more of his Kryptonian heritage. And while that time has only been a few weeks for Lois and Clark, it’s been seven years for Jon. Superboy? Well, in the aftermath of the New 52 and Rebirth, it seemed inevitable one would eventually be reintroduced. I’m pleased DC Comics has chosen not to revive the Kon-El character. No terrible flaws I could point to, he just never appealed to me. As for Jon’s journey, well that’s a work in progress. 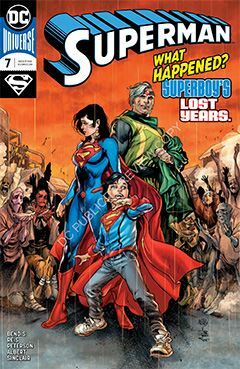 The cover touts it as “Superboy’s lost years,” but telling the story will clearly take a while. More than a single issue, for sure. As usual, the motives and character of Jor-El remain suspect, and I wish they would unveil who he really is, once and for all. I struggle to accept his identity at face value, but I have a hard time caring the longer the charade goes on.